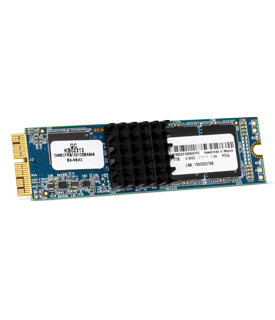 The newest member of OWC's Aura family of high performance drives sets the new gold standard SSD upgrade for PCIe equipped Macs, with guaranteed compatibility and capacity to spare. Featuring up to 2.3x faster performance and more efficient power management, the new Aura Pro X raises the bar again. Not all flash is created equal. The new Aura Pro X is manufactured with latest 3D MLC NAND flash, delivering superb dependability and unmatched speed. 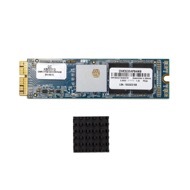 It's the perfect upgrade for your PCIe-equipped Mac. Rating: 5/5 Excellent Product October 1, 2018 Purchased 1TB OWC SSD for my MacPro ("Trashcan"). It was very easy to install. I chose to do a fresh install of OSX High Sierra and have had not problems with the drive. Only issue I had was instead of the full on "torx" drivers I received an "L"-shaped allen wrench, which worked fine for the torx screws in my MacPro, but it did not work at all on the Envoy Pro Enclosure that I put my old 265GB SSD (I need to get that torx driver to secure the enclosure), but the old SSD is up and usable in the Enclosure. The 1TB drive is very quick. Thanks OWC for a great upgrade product. Rating: 5/5 Good product. Instructions are contradictory. July 30, 2018 The Aura Pro X SSD is working great. No issues with its performance or the enclosure for the extracted SSD. If you're like me and read all of the instructions and watch installation videos before plowing forward, you may notice a discrepancy in the instructions for the installation of a heat "shield" and heat "sink". The clamshell case that contained the OWC Aura Pro X had a sticker that said "2013 Mac Pro requires heatshield. OWC p/n: OWCCAURAPROXHS". However a small printed sheet of paper that came with the order said "2013 Mac Pro Heat Sink Installation Please install the included heat sink to ensure the drive runs at the proper temperature. ..."
The thing that made these instructions confusing is that the factory SSD module I removed from the Mac Pro had a black plate-like piece attached to one side that I would characterize more like a heat SHIELD rather than a SINK since it was a solid piece of metal, relatively thick and lacked any heat radiating fins that I would associate with a heat SINK. I didn't purchase the OWC heatshield that was mentioned on the SSD clamshell and instead installed the heat SINK (with fins) that came with my order. All is working well. Unfortunately the installation instruction video didn't mention adding a heat shield or heat sink. The video was produced before either of these additions were recommended. Love the OWC SSD volume Icon! See attached. It inspired me to change the long-standing name of my startup volume from 'Macintosh HD' to 'Macintosh SSD'. It really pops. Rating: 5/5 Works Great! May 23, 2018 No issues here. Just make sure everything lines up and follow the directions for replacing your ssd and you should be good to go! Rating: 5/5 Easy install - Fast drive February 20, 2018 Finally I had an afternoon to pull out the stock 250gb SSD drive from the MacPro yesterday so I plunged into the task. The task wasn't hard at all compared to other drive upgrades I've done with other Macs but there are a few quirks that you need to expect. 1) The Envoy Pro enclosure that comes with this kit is specially made for the original 2013 MacPro SSD drive so you can't use it with the Aura Pro X SSD. If in the past you cloned the system drive to the new drive in an enclosure, you can't do that here. No big deal. 2) The MacPro will start up slowly the first time after you install the Aura Pro X, at least it did with me so expect that. 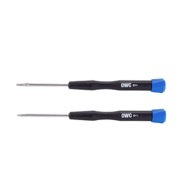 3) If you decide to use Carbon Copy Cloner instead of the OWC recommended method, you will have to reinstall OS X on the Aura Pro X as the operating system is different on the original SSD drive. While using CCC worked for me it required three reboots, one to boot from the original drive now in the enclosure, the second from OSX Recovery disk to download the new OS and a third to finish the installation. Even with the reboots, the whole process took around 2 hours. Unless you are reasonably experienced, I recommend to follow OWC's instructions. The Aura Pro X is noticeably fast than the original drive, The MacPro boots faster, loads programs faster and the extra drive space is appreciated. Rating: 5/5 Painless and worth it January 2, 2018 I'll keep this short. I bought and installed a 1GB Aura Pro SSD. It took only a few minutes, most of the time spend cleaning the dust off the cooling fins of the Mac. It installed painlessly, booted right up with the old drive, OS transfer was very fast, and moments later I was done. Painless, fast, and secure. Oh, I placed one called to support during install, file system related, was cleared up in less than a minute. Rating: 5/5 Great upgrade to the MacPro December 24, 2017 My "trash can" MacPro was bought when they first came out and I ordered it with only 256 GB of ram assuming an upgrade would be available soon. No such luck. The Aura Pro X SSD is great. Bought it with the Envoy to make migration easier and it took about 1 hour soup to nuts and I am up and running with a 1Tb SSD that is much faster than the original drive! Kudos to Other World for this product! Rating: 4/5 Beware of installation issues November 18, 2017 Two points to be aware of when installing: 1) compared to the OEM Apple drive it took a lot more force to get the SSD properly inserted and seated into the slot, although eventually that was possible 2) After using Cmd+Option+R and entering Disk Utility (DU) it took several attempts at opening and closing disk utility for the OWC Aura Pro X drive to appear in the list of all connected drives so it could be formatted. After contacting OWC support I was told this is a known issue and to just keep tying until it shows up in DU. However, that was not documented on the site and would have been helpful / reassuring to know. Having said that drive now installed and successfully running 10.13.1 and running well. Response from MacSales.com, Call Center November 20, 2017 Hello! I'm very sorry to hear about any issues you may have had when installing the Aura Pro X. The Disk Utility glitch is new to 10.13, and can occur with any unformatted drive. 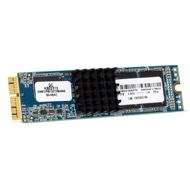 We do have a bit about this in our knowledge base, here: https://eshop.macsales.com/Service/Knowledgebase/Article/10/729/Aura-Pro-X-SSDs-1013-Requirement I do apologize that this was not made more apparent on the product page. As always, if you have any questions, please let us know and we'll be happy to help!